Fall is my favorite season. I love it when the leaves start changing colours - the colours are so beautiful. I love the sound of walking through the dried leaves. I love the crispness of the air and that there are fewer bugs. I HATE bugs! 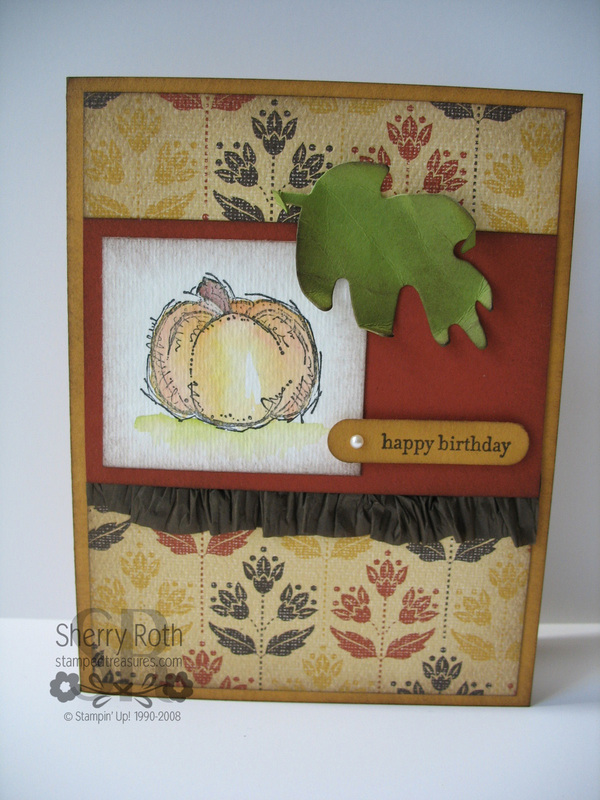 With that in mind, I thought I would share this fall card we did at stamp club this month. It uses the Autumn Spice DSP from the mini catalogue. This paper is fabulous - the colours, the texture and the thickness of it makes it wonderful to work with. Notice the little espresso ruffle? That's our waffle paper. I love the look that this gives your projects. It's so easy to use and doesn't add a lot of bulk. Click here to order Stampin' Up! product online 24/7! Place an order any time of day or night. Simply click the Shop Now button! Choose $165 worth of Stampin' Up! product for just $135!! If you have any questions about anything you see, feel free to email me. The content on this blog is the sole responsibility of Sherry Roth as an independent Stampin' Up! demonstrator and the use of and content of classes, services or products offered is not endorsed by Stampin' Up!